Varieties of Experience | Patchogue Arts Council, Inc. 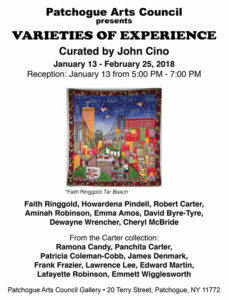 The Patchogue Arts Council is proud to present Varieties of Experience, a group exhibition curated by John Cino. The exhibition will feature works by Faith Ringgold, Howardena Pindell, 2004 MacArthur Fellow Aminah Robinson, Emma Amos, Robert Carter, Emmett Wigglesworth, Ramona Candy, David Byre-Tyre and others as well as works from the collection of Robert Carter. The exhibition will be on view at the Patchogue Arts Gallery from Saturday January 13 and runs through Sunday, February 25, 2018, with an opening reception on Saturday, January 13 from 5:00 PM – 7:00 PM. Art often reflects human emotions, experiences, and realities through individual interpretations. Racial bias can become a catalyst for creating works that provoke thoughts and discourse. The artist can choose to respond personally, historically, or politically to reflect, initiate change, invoke emotion, or celebrate heritage. Varieties of Experience includes Faith Ringgold, Howardena Pindell, 2004 MacArthur Fellow Aminah Robinson, Emma Amos, Robert Carter, Emmett Wigglesworth, Ramona Candy, David Byre-Tyre and others as well as works from the collection of Robert Carter. Varieties of Experience opens Saturday January 13 and runs through Sunday, February 25. An artist’s reception is scheduled for Saturday, January 13 from 5:00 PM – 7:00 PM. * (c) Faith Ringgold, Courtesy ACA Galleries, New York This image is solely for promotional and educational purchases for your exhibition. Permission from ARS must be granted for any other usage. Event: “PAC’s Amazing Art & Oil Club” – Support the Arts!